Erica Olsen lives in the Four Corners area, where she does archives and curation work for archaeology museums. A graduate of Stanford, Harvard, and the University of Montana MFA program, she has also been a Djerassi Fiction Fellow at the University of Wisconsin. Her short fiction has appeared in ZYZZYVA, High Desert Journal, and other publications, and her nonfiction pieces in magazines including Fine Books & Collections and High Country News. 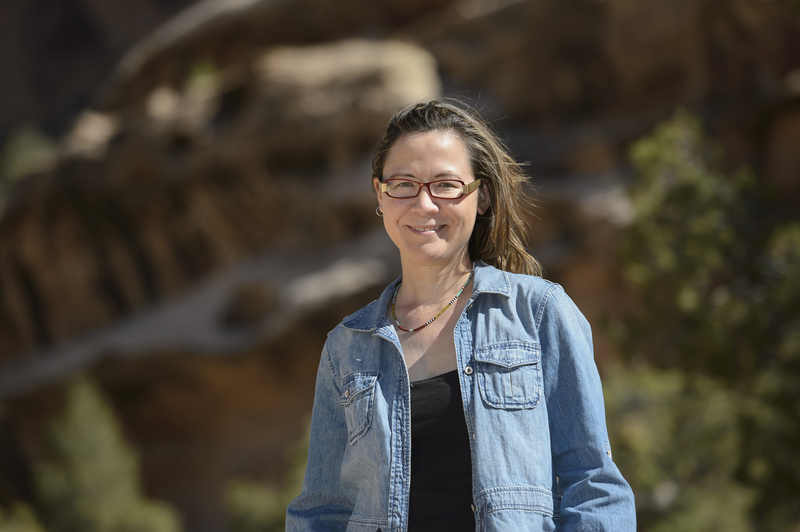 Her work has received awards including the 2011 Barthelme Prize for Short Prose (for “Grand Canyon II,” included in Recapture). Q: What events or people inspired you to write the stories in Recapture? A: The collection as a whole has been shaped by my experience visiting and later living and working in the Four Corners area. My experience here now spans almost two decades, and there’s almost that much time in these stories. The earliest versions of the stories “Driveaway,” “Reverse Archaeology,” and “Everything Is Red” came directly out of my first experiences of backcountry hiking in southeast Utah in the early 1990s. I’ve never stumbled on a prehistoric pot in situ, butI remember the addictive craving for discovery of sites and artifacts, mixed with a kind of ruefulness, a sense that we’re fooling ourselves with the illusion of being the first one there. There’s a direct line between those stories and a story such as “Grand Canyon II,” in which nature itself is a replica, a constructed artifact. Many of the stories have some kernel of autobiographical fact in them—for instance, I did once meet King Kong on top of the Empire State Building, as the narrator in “Wonders of the World” does. As the collection came together, I found myself writing new stories inspired by themes and elements that were present in the older stories, waiting to be revisited and pushed further. Q: Which story in the collection is most directly based upon personal experience? A: “Grand Canyon II,” for its portrayal of my complicated response to nature, culture, and art. Story that I most wish were based on personal experience: “Persuasion.” If only there were a magic bookmobile roaming the back roads of Utah’s canyon country! That would be great. Q: Why did you choose to title the collection after that particular story—Recapture? A: “Recapture,” in the story title, is a place name in San Juan County in southeast Utah—a beautiful name. According to the WPA Guide to Utah, Recapture Canyon was “named by Peter Shirts, a hermit who settled in the San Juan country in 1877. Shirts believed that Montezuma escaped from his Spanish captors and was recaptured in this canyon.” So it’s a place name that is totally historically inaccurate. That’s perfect for the story, which builds on the premise that an Ancestral Puebloan ruin was moved from the Recapture Canyon area to Southern California around 1900. That’s not as unlikely as it sounds. I based the idea on the Manitou Cliff Dwellings, which were moved from McElmo Canyon in southwest Colorado to Manitou Springs, CO, in the early 1900s. As a title for the collection, the word “recapture” evokes major themes of the collection: memory and our relationship to the past. There’s something impossible and yearning in the sound of the word, as well as a kind of covetousness and desire. It captures the themes of the collection in a single word. If it didn’t exist as a place name, I would’ve had to invent it. Q: Could you tell us about any interesting experiences or influences you had while creating Recapture? A: I discovered Torrey House Press in early 2011. At the time, I was returning to writing fiction after four or five years in which I’d concentrated on nonfiction magazine pieces, mostly about books, libraries, and archives—topics related to my study in the graduate archives management program at Western Washington University, and then my work in museums. During those years, I basically thought of myself as a failed fiction writer. As it turned out, museum work provided a bridge back to fiction. It was the catalyst to unify the collection around themes of memory and preservation. THP provided the spark that made me think of the stories as a collection. Another influence on the stories in Recapture has been the long history of artifact theft in southeast Utah, most recently and prominently the 2009 artifact bust in Blanding, when 16 people, including prominent citizens, were arrested for illegal dealing in Indian artifacts in this small town of a few thousand residents. I was living and working in Blanding at the time. The story got national and international news coverage (New York Times, LA Times, the Guardian in the UK), and coverage has continued into 2012. Most of my stories that deal with artifact theft were written long before the 2009 events, but unfortunately it’s an evergreen topic in this area. During 2011-12, when I was completing work on the book, the Utah news was full of stories about the controversial firing of the staff of the Utah state archaeologist’s office and about the state legislature’s threats to close several state park museums, including Edge of the Cedars in Blanding, where I worked in 2009-10 as an archivist. Several stories in this book are inspired by what-if scenarios of radical change in landscape, parks, and museum preservation. Q: Our ultimate mission is to publish great Western literature that increases public awareness and appreciation for Western land management, cultures, history, conservation, and environmental issues so that in the end we all end up with, simply put, more grass on the mountains and water in the streams. Which Western issues concern you most? A: As a fiction writer, I’m most interested in Western identity. Who is a Westerner? Am I one? I’m an American of Norwegian, Swedish, and Korean descent, born in Hollywood (purely an accident of birth—the Kaiser Hospital was on Sunset Boulevard), raised all over the U.S., now living and working in the Four Corners area. I might have more in common with the immigrant miners from all parts of the world who descended on the West in the 1800s, than with someone born and raised here. As the title of a book by Bill Kittredge asks, Who owns the West? I think that identity is a large window through which to understand and appreciate the many different points of view that people have on issues such as land management, conservation, and so on. Identity isn’t fixed, and neither are things like place or landscape. If we accept that these things are not fixed and unchanging, we might find common ground to work together on particular issues. Q: Many of your stories incorporate romantic relationships—couples or ex-couples interacting in the very distinctive environment of western landscape. To what degree are these relationships dependent upon place? A: Rather than dependent on place, I think of place as almost a third character in these relationships. A place, new or familiar, can be beguiling, provoking, tempting, comforting, frightening, annoying … I’m inclined to switch the terms of the question around and argue that the way my characters see place is dependent on their relationships—on who they are, alone or together, in the landscape of the story. Q: Your stories incorporate many different “artifacts”—from more conventional ideas of artifacts—potsherds, etc.—to less-conventional—a toothbrush, silences stored in jars, etc. To you, what makes something an artifact? A: An artifact is physical evidence of history or prehistory—evidence that something happened. It connotes truth and authenticity. An artifact is also a visible form of memory, which is personal and subjective. People possess artifacts; they may also be possessed by them. The characters in my stories choose to preserve, save, or curate certain artifacts, and sometimes, as in “Reverse Archaeology,” to deaccession and destroy them. You can get rid of physical artifacts. Memories, however, tend to stick around. Q: How did you become interested in archeological preservation? A: This interest comes directly from my first hikes on public land in southeast Utah, starting in 1993. Almost twenty years ago! I’ve always been interested in the tension between the very human desire for discovery and authentic experience, and the necessary apparatus of preservation (laws, rules and regulations, trails, signage). This is the same dilemma that archivists and museum curators face: how to balance the need for both preservation and access to fragile, unique items. Q: How does your museum work affect your writing (and/or vice versa)? A: Work in general is important subject matter for fiction. In my stories, it is as important as relationships. My own museum work has given me an endless range of approaches to the fictional themes I’m obsessed with, like memory and preservation. Archives and curation work has interested me for a long time. While in the MFA program at Montana, I had a student job at the university archives. While working as an editor at California College of the Arts in San Francisco, about eight years ago, I volunteered in the anthropology department at the California Academy of Sciences, helping to inventory the collections. In 2006-2007 I did a post-grad archives management certificate at Western Washington University. This circuitous path led me to my current working life in the Four Corners. I still do freelance editorial work, mostly for publishers in the fields of art and design, including work on museum catalogs. In the Four Corners area, I’ve worked on archaeology archives and curation projects and as a lab/collections manager for an archaeological excavation at the White Mesa uranium mill south of Blanding—the only operating uranium mill in the U.S. This work has given me an insider’s perspective on artifact theft, preservation, museums, and landscape heritage. Sometimes my vision of parks and museum work is surreal. Borges’s library stories have been a huge inspiration in this regard. Q: What are some books and authors which inspire you? A: Red Cavalry, by Isaac Babel. The short stories of Nathaniel Hawthorne. The clarity and artfulness of John McPhee’s nonfiction writing. W. G. Sebald, for the way he moves between individual lives, memory, and historical event. Q: How has the West shaped you? A: This question takes me back to the issues of identity, home, and belonging. I think there’s an American myth or idealizing of the idea of a home town. Well, some of us don’t come from anywhere in particular. I’ve found an adopted home here in southeast Utah. This is where I feel at home. How has the West shaped me? I’m still finding out. More specifically, I know I wouldn’t have put the stories in Recapture together without the time I’ve spent living and working in the Four Corners area. The time at Edge of the Cedars was especially important. I lived in a little trailer across the street from the museum, and I had the best view in town—west toward the Bears Ears, incredible sunsets, the Abajos to the north. When I’m writing, I like to be able to look out and see a long way. Last year, I worked on some of the stories in this book in camp during a backpacking trip in Dark Canyon and a canoe trip on the San Rafael River. Q: What do you hope readers will receive or learn from reading your book? A: I hope readers will find at least one story they love and one story they hate. I want them to be surprised, to be provoked, and to take nothing for granted—not even conservation or preservation. Recapture is a fantastic book. Olsen has mastered the short story. I can’t say enough good things about her book, but I intend to try.